"We provide specialist oil and gas related products that include 100 per cent portable oil free compressors with desiccant dryers, steam boilers, complete state-of-the art oil and gas skid-mounted and trailer-mounted support modules. We have recently added a new range of oil and gas specific material handling equipment which has been manufactured in accordance with DNV 2.7-1 certifications. This range includes containers, lifting frames and half heights which are ideal for the secure transportation of larger items of equipment, and are also ISO/CSC intermodal road, rail and sea freight certified," says Pat Fallon, Group COO, Byrne Equipment Rental. 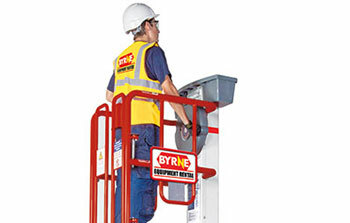 Also available in this certified range, Byrne has cargo baskets for the secure transportation of drilling tubulars, pipe spools and longer structural members. Its certified rigging containers provide ideal control and management of lifting equipment for regular lifting activities and turnarounds/shutdowns, which can be further complemented by the firm’s workshop containers offering a workplace solution right where it is needed, ensuring that operational downtime is minimised, he says. Byrne’s reefers are ideal for the storage and transportation of food, chemical and other products where a chilled or frozen temperature is required. They can be powered by the vessel, rig or platform electrical supply, or Byrne can provide its clip-on generator that can be mounted on the reefer to supply power during transportation, or at final location. "Our newest addition to the range are the Pecolift X and Ecolift X low level access platforms which are ATEX certified and are particularly useful in the oil and gas sector where low level working at height access is often required. No power is required as the platforms are powered by battery and are hydraulic oil free, making them useful in hazardous ATEX zoned work areas. They are efficient, eco-friendly, simple and safe to use," he says. To protect both people and equipment, Byrne Equipment Rental provides blast-resistant modular buildings. These are available in single or multi-unit modules that are ready for immediate deployment and fitted out to the highest standard. Certified with a blast rating of up to 10 PSI with a duration of up to 200 MS, the buildings are API compliant. Byrne’s inflatable habitats are also a unique and innovative solution for the protection of personnel, equipment or materials in harsh environments providing a controlled, enclosed environment that is quick, easy and safe to use, not to mention a cost effective solution. "At Byrne Equipment Rental, we work hard to ensure our rental fleet is constantly updated and adheres to specific requirements and certifications depending on the location of operation, whilst also providing appropriate modifications carried out to industry standards e.g. certified lifting modifications and accessories to carry the latest and most efficient brands of equipment," he says. The company’s corporate ambition is to continuously add products to its portfolio in order to further enable operational efficiency through equipment rental and lease solutions. With this, Byrne also delivers a dedicated commitment to customer service which is unparalleled in the industry, and this is supported by providing a 24/7 round the clock service accessible to all customers at any given time. For its offshore clients Byrne provides dedicated service and maintenance teams permanently based on site to ensure that clients’ requirements are met in a timely manner, he adds.